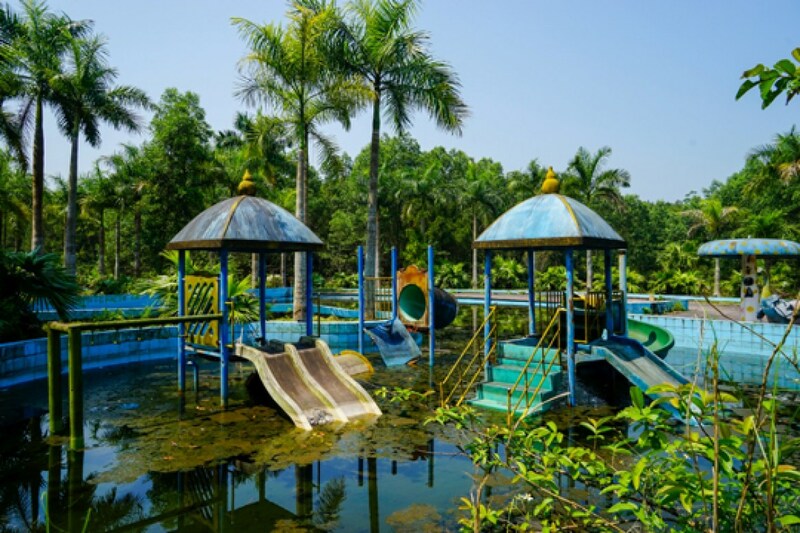 The park had three waterslides, a waterpark and an amphitheater, all centered around the scenic Thuy Tien Lake. The jewel of the water park was a huge dragon centerpiece housing aquariums filled with manta rays, sharks and other exotic fish. Visitors could even take the spiral staircase up the “ribs” of the three-story high dragon for panoramic views over the lake. Unfortunately, the park was never completed and was plagued with problems. “There wasn’t enough to do and lake was just too big. There were no lifeguards and every year, some kid would fall in the water and drown,” says Lan. Abandoned after just a few years, the park now sits empty, a wonderfully creepy and eerily quiet setting perfect for a Zombie apocalypse movie. There’s been talk about renovating and re-opening the water park, but until now, all it is is talk. The amphitheater continues to sit empty. The slides now wind their way through leafy trees. The forest is reclaiming what was once a lazy river. Visitors leave their mark in the form of graffiti, adding to the abandoned aura of the place. While the park isn’t technically open, there are ways to get in. When we visited in April 2018, we found a guard at the entrance who showed us an official paper that said the park was closed. However, catch the guard on a good day or slip him something for his troubles, and you’ll likely be granted access. There’s even a shaded structure to park your motorbike near the dragon aquarium, and an attendant to collect a parking “fee”. However, we found a better way into the park through the back. Follow the road leading to the Tomb of Khai Dinh. Before the tomb, turn off at the sign for restaurant called “Nha Hang Sinh Thai”. Continue past the restaurant and take your second left onto a concrete path that passes by some houses. At the end of the path, you’ll see a little bridge which takes you into the park, close to the amphitheater and the waterslides.